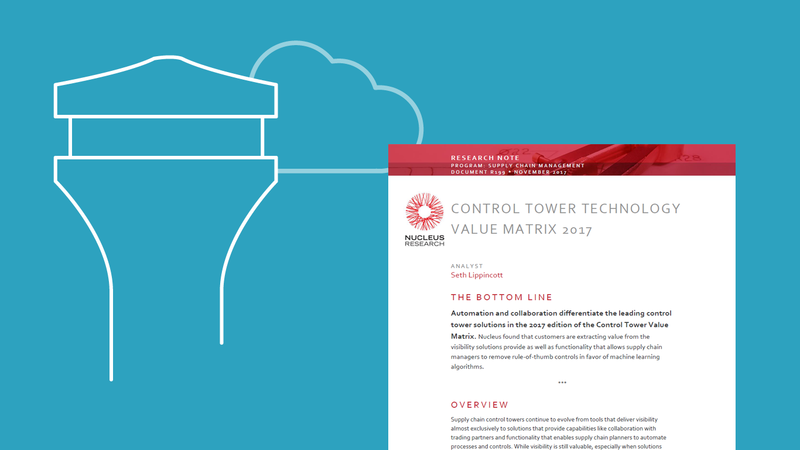 Nucleus Research has published its Control Tower Value Matrix 2017, which gives a detailed insight into the current state and value of control towers. The report breaks down vendor offerings by functionality and usability, providing a matrix by which to evaluate control tower solutions currently on the market. That covers quite a range and reflects how far control towers have come in recent years, and the many types that are available. The Control Tower Value Matrix provides a useful breakdown of the various types available from 13 different software vendors. At their most basic, they provide a global (or near global) view of the supply chain. Control Towers originally arose due to the need to gain visibility over the increasingly complex and fractured supply chain. Control towers attempted to give a single version of the truth across functional boundaries, and across suppliers, contract manufacturers, transportation carriers, and third-party logistics. But what use is it watching something go wrong, if you can’t intervene to fix it? Control towers have evolved to incorporate tools that allow supply chain managers to not only monitor, but also to intervene and correct those issues. However, this has typically been limited to those parts of the supply chain under a company’s direct control. The next stage of development is cross-organizational collaboration, across multiple tiers of customers, suppliers, and logistics service providers. This enables supply chain managers to not just address issues directly under their control, but to work with business partners to solve a much broader range of problems that occur in all parts of the supply chain. Control towers are now automating many functions that previously required human intervention. For example, orders can be automatically created when a stock item reaches a predetermined value. There are many such tasks that can be automated, and freeing up people to work on more valuable tasks. What Does a Control Tower Do for You? Hub-Spoke Model or one-to-many or hub-spoke model, gives some companies priority at the expense of others. 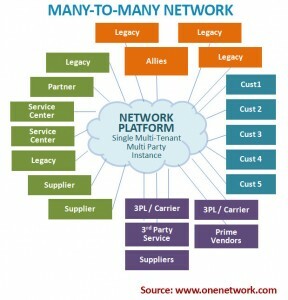 Multi-Party Network or many-to-many network connects all parties through a single connection to the network. Combine all these levels (and more), and the value control towers provide to companies is significant. Many companies are still struggling to achieve end-to-end visibility in their supply chains. Control towers provide that and more. The value of a control tower varies widely based on the degree to which it maximizes the value of each of the four stages: visibility, actionability, collaboration and automation. And to a large extent, that realization of full potential depends on the foundations upon which the control tower is built. In The Rise of Supply Chain Control Towers I explained the flaws in traditional control towers that are built on a hub-spoke model. 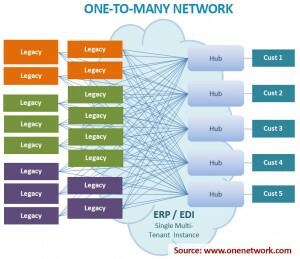 I won’t rehash that here, but simply put, such point-to-point models offer limited opportunities for visibility and optimization due to disparate systems; and such connections are cumbersome to implement and maintain. Control towers that are built on solid foundation of real-time data shared across a multi-party network, offer much more potential for savings, speed, agility and resilience. Real-time networks eliminate information delays; provide end-to-end visibility, and better optimization thanks to fresh, big picture data that reflects the reality of the supply chain now. They also provide the full context for better decision making, including providing actual data on orders, inventory, shipments and capacity constraints across all nodes of the network. Reduced safety stock holdings, 10-55 percent, average of 38 percent. So the benefits of implementing a control tower on a network are striking. Companies that have complex, global supply chains are especially well-suited to multi-party networks. 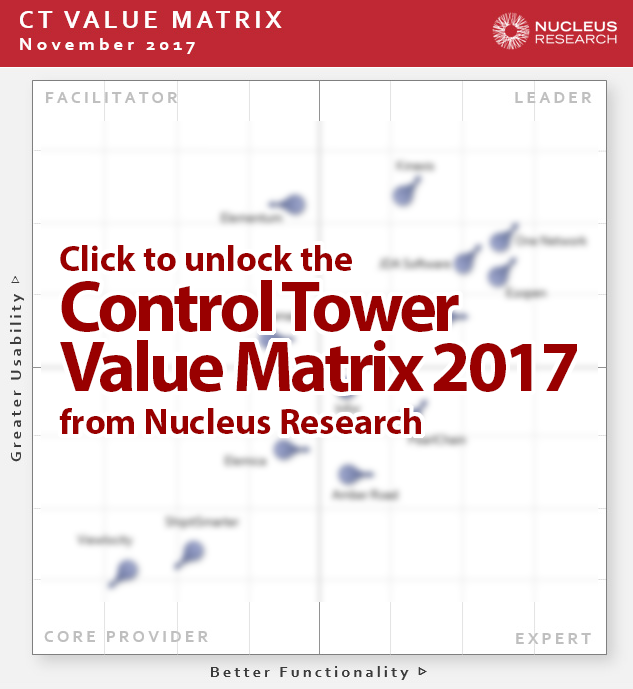 Nucleus Research’s Control Tower Value Matrix covers a lot of vendors and a lot of types of control towers, and it is well worth learning about them all, and examining all your options.